Timberwolf log splitters are manufactured by a family run business in Rutland, Vermont, who have recently celebrated the shipping of their 10,000th log splitter. All of their models use the reliable Honda engine, and as their log splitter frames are cut and welded in-house they have total quality control. Interestingly they are the only company to offer unique back-saving options such as multi wedges, log lifts and table grates. The Multi-split wedges for example minimizes the time required to get the job finished. Furthermore, they are the only manufacturer as far as I am aware that utilizes 12” tall wedges on all of their full sized splitters, which means increased production time and a lot less work. The TW-P1 is their basic model and is both for use at home and on the farm. It comes standard with log cradles and a reliable Honda OHV GX Series engine. They are available with a number of standard and optional features that help to increase production, making them versatile and convenient to use. Cylinder Size 24" x 4" x 1½"
The TW-2 is a rugged machine designed to withstand heavy use on the farm or at home. 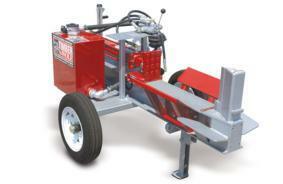 It provides 20 tons of splitting force, 242 cc Honda OHV GX Series engine, 16 GPM pump and 9 second cycle time. This is an ideal machine for landowners who intend producing more than 10 cords of wood per year. Cylinder Size 24" x 4" x 2"
Shown here is the TW-2HD unit, with it's durable components and dependable Honda engine for heavy use. 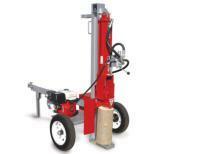 It can be adapted for hydraulic options such as log lift and wedge lift for easier splitting of larger logs. A “Beefed-up” longer version of the TW-2. Designed specifically for Outdoor Furnace users. An alternative to the TW-P1 for those who need a versatile design. 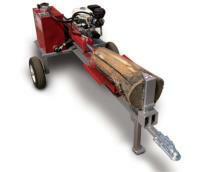 Splits logs vertically or horizontally.